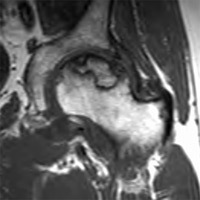 A 43-year-old man with a history of alcohol abuse, pancreatitis, and chronic liver disease presented with left hip pain. • Patients may be asymptomatic early in the disease process but ultimately present with pain and limitation of motion. • Pain is most commonly in the groin area but may also manifest in the ipsilateral buttock, knee, or greater trochanteric region. • Pain is usually exacerbated with weight bearing and relieved with rest. • Predisposing factors include corticosteroids, alcohol abuse, chronic liver disease, pancreatitis, coagulopathy, and hemoglobinopathies; traumatic etiologies include femoral neck fracture, hip dislocation, and slipped capital femoral epiphysis. 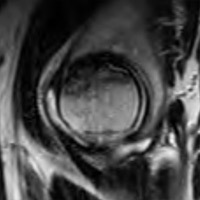 • MRI is the most sensitive modality and demonstrates changes well before plain film changes are visible. 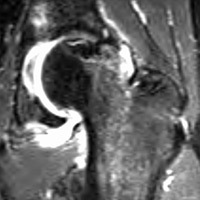 Treatment varies with location and stages of osteonecrosis: conservative (anti-inflammatory, analgesia, non-weight bearing), core decompression, and joint replacement for end-stage disease. — Waikeong P. Wong, MD, PhD, is a radiology resident at Saint Barnabas Medical Center in Livingston, New Jersey. Zurlo JV. The double-line sign. Radiology. 1999; 212:541-542. Manaster BJ, May DA, Disler DG. Musculoskeletal Imaging. Philadelphia, PA: Mosby Elsevier; 2007. Copyright © 2012 Great Valley Publishing Company Inc., Publishers of Radiology Today. All rights reserved.